Eight year-old French mare, Belina Josselyn won the 98th running of the renowned Grand Prix d’Amerique international trotting race at the Vincennes Racetrack, yesterday. Driven by popular Jean Michel Bazire, Belina Josselyn raced to an impressive victory as 18 horses lined up for the challenge over a long distance of 2,700 metres and staged in front of 40,000 spectators. It was, Danish Uza Josselyn (Gabriele Gelormini) the fastest trotter at first, opening a small lead from Davidson Du Pont (Franck Ouvrie) and Swedish Readly Express (Bjorn Goop). Under the guidance of Jean Michel Bazire, Belina Josselyn dashed strongly from the outside during the last 500m while Uza Josselyn and Davidson Du Pont started to slow down. Bazire’s mare managed to win the race after overtaking Norwegian Looking Superb (Alexandre Abrivard) and Readly Express in the final metres. Belina Josselyn clocked an average time of 1.11.7” per kilometer. This victory was Bazire’s fourth win in the Grand Prix d’Amerique, an event considered by many as the World Cup in trotting racing. It should be noted that the record of the race is 1.11.2” established last year by Readly Express and in the previous year by Bold Eagle. Belina Josselyn is trained by the same Jean Michel Bazire and owned by Pascal Bernard. Davidson Du Pont finished fourth from American Propulsion (Orjan Kihlstrom) and Bold Eagle (Franck Nivard). This will remain a memorable edition for Jean Michel Bazire. Apart from Belina Josselyn, he is also the trainer of Davidson Du Pont and Looking Superb which also obtained a good place. 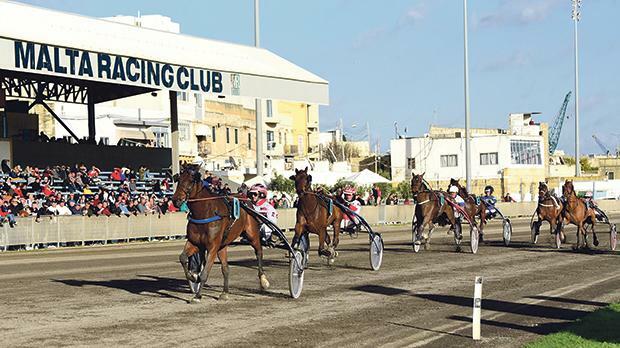 Meanwhile, the second meeting of the season was held yesterday afternoon at the Marsa Racetrack. This programme consisted of seven races all for trotters on a short distance of 2140m. The most important race was open for class Premier trotters and which was won by Ultra De Vindecy and Rodney Gatt. Gatt ended the best driver on the day with three wins.